I'm going to make the sand textured base for the Pyramid. 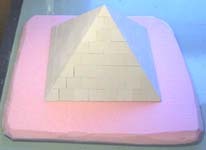 For instructions on building the Pyramid, go to the Quick Easy Pyramids building instructions page. To do this you need 3 things: Salt, paint and styrene foam insulating board. This is the stuff they use for sheeting on houses before they put siding on. You can get it at any lumberyard and usually comes in pink or blue in thicknesses of 1/2", 1", 2" and even 3". If you can't find styrene, any kind of stiff board will work. I'm using latex house paint. I've shown a sample of the sand color to the right. 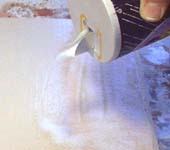 Using a wide brush, apply a thick coating of paint on the surface. If you would like me to send you a sample chip of this color, mail me a self-addressed stamped envelope or send me an e-mail when you place an order. Any store that sells paint can mix up a quart the exact color to match the sample. 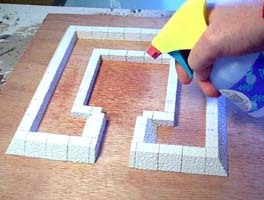 Liberally sprinkle sand onto the surface, covering the whole board. Let this dry completely! The salt will stick only when it's completely dry. When I was doing this test, I thought that the paint might dissolve the salt. I found that there wasn't enough water in the paint to cause this to happen. Tap the excess salt off the board (over a trash can). Once dry, the salt sticks quite well. Now put another coat of paint over top of the salt. Really slop it on! You may want to thin the paint a little so it will go into all the cracks between the salt granules. When finished, you will have a nice sand texture that you can apply to any desert scene you like. Here's a photo of the sand base under a pyramid. For instructions on how to build the Pyramid, go to the Quick Easy Pyramids building instructions page. Instructions for making the palm trees and plants are shown further down below. 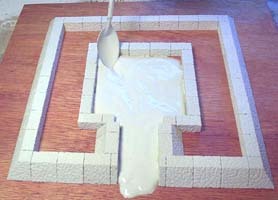 This section will show you how to add a more realistic looking sand texture to your terrain. If you carve a foam base, you get a chiseled look. Instead I wanted the surface to look like gentle waves of sand moved by wind. To do this I'm going to add plaster to the surface. Looking back, I probably shouldn't have used 1/4" plywood for the base. Plywood warps when it gets wet, so you will have to seal it or use something that isn't affected by water. 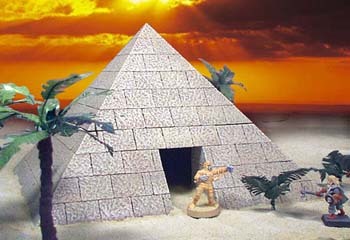 To see how this pyramid is built, check out the Pyramid with Tomb Chamber building instructions page. Start by soaking the surface with water. If you don't, the plaster won't flow, but instead set up instantly as it hits the dry surface. Really soak it! You can't get it too wet! Mix up some plaster. It should be the consistency of a thick milk shake. Give the surface one last spray of water before you pour it on. The blocks and wood should look glossy with water. Pour the plaster onto the wood surface. Use a spoon to shove the plaster around. Be sure the plaster slopes up against the blocks (just imagine a pile of sand setting against it). 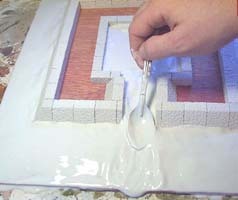 As the plaster thickens up, push it around with the spoon and try out make mounds and peaks to represent piles of sand. 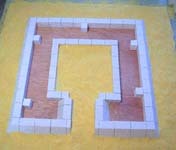 In the doorway, push the plaster out of the way to make a path into the inner chamber. When I finished, I had to put a pile of heavy books on top of the pyramid base to keep it from warping while it dried. Be sure to let it dry completely before you continue. I would suggest letting it set overnight. This time I'm going to use corn meal for the sand texture. It works really well because the particles are more irregular shaped than salt. Paint on a layer of water based glue and sprinkle a thick layer of corn meal on top. When it's dry, knock off the excess and paint it a sand color. 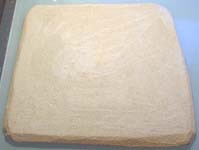 To see more of the texture, dry-brush it with a lighter color as well. 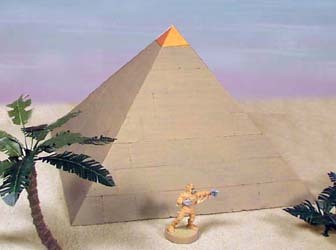 Here is the finished pyramid with the sand painted. For instructions on how to build this pyramid, check out the Pyramid with Tomb Chamber building instructions page. 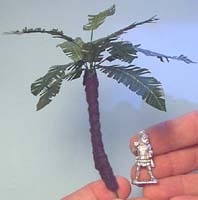 To make palm trees, you will need a super glue (cyanoarylate), tacky glue (or any that will glue cloth), and some floral wire (green 22 gauge wire). Lastly you will need some leaves from fake flowers and some brown felt. 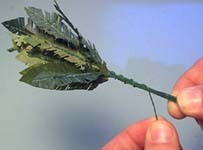 These fake leaves are made of cloth with a plastic coating and are glued to a plastic branch. This makes them easy to remove. 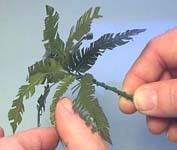 I suppose you could do this with plastic leaves, but they will be more difficult to cut, slice and glue wire to. Most leaves will be too large and the wrong shape. Palm leaves should be a little longer than the figure you intend to use. 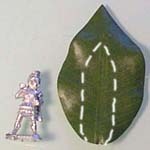 Cut the leaf into the shape shown on the dotted line. 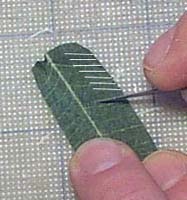 Using a hobby knife, cut a series of slits in the direction shown. They should be fairly close together (the closer you get them, the more realistic your leaves will look). Next go back and occasionally cut in the other direction to remove a few pieces here and there. Cut an 8" piece of floral wire. 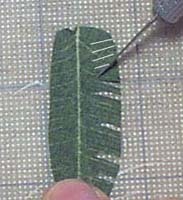 Use super glue and glue the wire onto the backside of the leaf. I'm going to put about 10 leaves on a tree. You don't have to put that many but the more leaves you use, the fuller the tree will look. 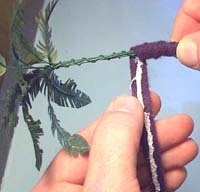 Make one of the leaf wires extra long. Gather the leaves together in a bunch. Take the leaf with the extra long wire and wrap it around the rest. Spread the leaves out, wire side down and bend them in a gentle arc. There are a couple of ways you can mount your trees. If you have a hard surface like plywood, you can spread a few of the wires out to support the tree. These will be glued to the board and covered with sand. If you're using foam insulating board, you can trim off everything except a couple of wires and stick the tree straight into the foam. Cut a strip of felt about 1/4" wide and 12" long. 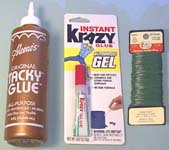 Place a bead of Tacky glue on the strip. Wrap the strip around the trunk starting from the bottom. Overlap the felt as you go and it will leave ridges on the trunk. Here's the finished palm tree. For extra realism on the trunk, you can dry-brush it with a light brown or light gray paint. 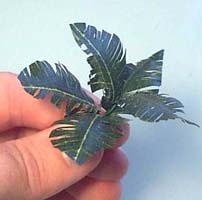 If you just place 3 or 4 of the leaves together, you can make a small palm plant to add foliage to your oasis or jungle.